MARPOS has assembled PCBs since 2005. We assemble the product in entirety or we can offer each operation separately. 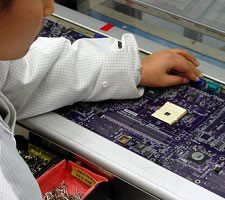 In case of complete installation we take care of the entire production process, including the preparation of printed circuit boards, their manufacture, mediation of component supplies, continuous quality monitoring and final product assembly. For partial service you can deliver your own PCB, PCB component or section of the components. Any remaining parts of the process is ensured by our team. We specialise in prompt service with a high quality finish. Our modern technology allows to satisfy the most demanding customer requirements. Our production system allows you to fulfil your dynamic business needs. 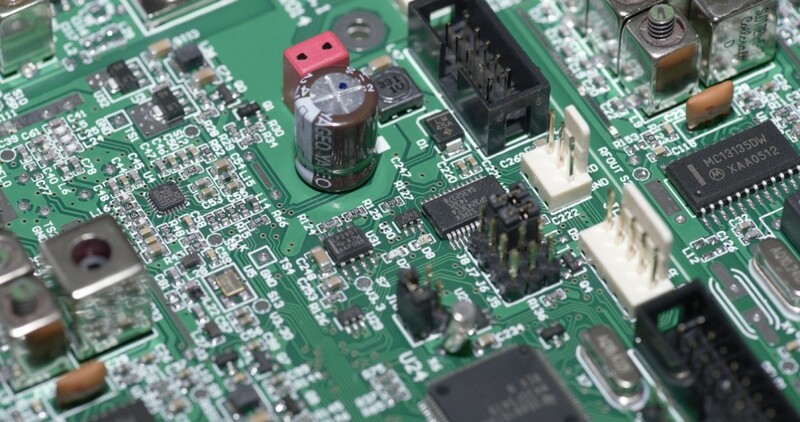 Our team of engineers and experienced workers in manufacturing have helped to solve production problems of many customers and we have thereby gained a great reputation as the preferred manufacturer of printed circuit boards. Workplace mounting hole components (THT) are equipped with a wide range of molding machines and agents for shaping the radial and axial components in strips, for axial components for casting „upright.“ Custom fitting is carried out in antistatic adjustable retrofit tables. 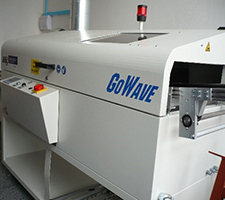 Assembled PCBs are soldered by the machine soldering wave SEHO German GoWave. This is a sufficiently powerful soldering system with a wide range of uses in production. The device provides the ability to solder widths up to 300 mm, additionally meets also in other respects (for example it has efficient preheater specific solder surfaces, microprocessor control and regulation, etc.). The advantage of this device is the possibility of its use both in low-volume (resp. Individual) production as well as during the loading of large series. Hand soldering is carried out with the help of Japanese HAKKO soldering stations HAKKO. In order to clean solder flux residues we use automatic spraying equipment from DCT Czech – InJet388-MCRD. This is an automatic cleaning machine. It also facilitates the final wash and drying, which is used for surface fixing printed circuit boards. This technology ensures the elimination of solder paste and SMT adhesives, removing flux residues or cured lacquer from PCBs. Dividing printed circuit boards is conducted on a semi-automatic DPS divider. Part of the workplace, the control points, are equipped with facilities to conduct inter-operational checks, including optical inspection. Final testing is performed in various forms of electrical tests delivered and designed by the customer or by our own development department. We carry out the commissioning and programming of PCBs according to customer requirements. We install the products in plastic or metal boxes which include cable bundles. The assembly SMT parts into PCB in the company MARPOS s. r. o. is realised in two SMT machines. 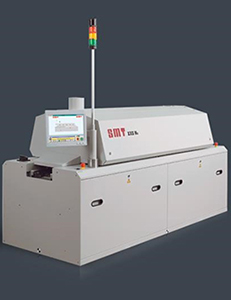 This line has three pick and place machines from the Swiss company ESSEMTECH. Their design meets the current demanding requirements. It offers a wide range of applications, ideal for mixed production in small series. Production is easily and quickly programmable without downtime. It includes intelligent feeders and automatic settings. The technology used is a world-leading. The machines contain large capacity feeders. This allows more types of boards to be placed in one pass. Most of the components remain permanently in the machin, helping to avoid unnecessary delays. The computer automatically recognises different types of feeders immediately after their installation. The exchange of feeders may be performed during the machine process or even when the machine is processing a previous task. It does not require additional programming and adjustments and eliminates errors. Ahead of these automats is the semi-automatic silkscreen Motoprint M from the company PBT. Reflow solder paste or SMT adhesives cure is done by reflow oven from the German company SMT Wertheim. The basic of this line is pick & place machine MYDTA MY200 LXe-10 from the Swedish company Micronic. This machine has a high-speed and high-precision mounting head with a total of nine nozzles and a maximum speed of 16,000 component pieces assembled per hour. The machine enables particularly excellent precision and high flexibility thanks to quick setup and overkill of feeder components for assembly. 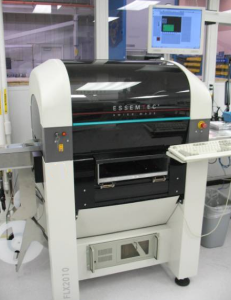 This machine enables continuous production of large series of printed circuit boards. 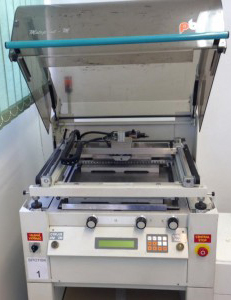 Ahead of this pick & place machine is a semiautomatic silkscreen with camera Motoprint M from the company PBT. Reflow solder paste or SMT adhesives cure is done by the reflow oven GoRewlow 2.3 from the German company SEHO. It is the newest and most high-performance fully conventional soldering equipment (reflow). Equipment of the product line GoReflow has a 2350 mm heating zone length and is an ideal manufacturing facility from small to medium power production. A difficult situations we reflow in Vapour-Phase Soldering Asscon VP450. It is easy to operate soldering system with automatic control of the process. The soldering system is capable of, for example, automatically recognising the termination of the soldering process, operatively setting the growth of temperature in the preheating section and providing a visual inspection of the whole soldering proces. The whole production process is under the control of trained workers certified by IPC-A-610D. Since 2008 we are certified company by TÜV SÜD Czech and we have a certificates EN ISO 9001:2009 and EN ISO 14001:2005 for the fields of “production and assembly of PCB“ and “electronic production“. Thanks to our universal machine equipment we are able to handle prototype orders as well as thousand-piece series. On site we control the assembled and soldered SMT and THT parts. 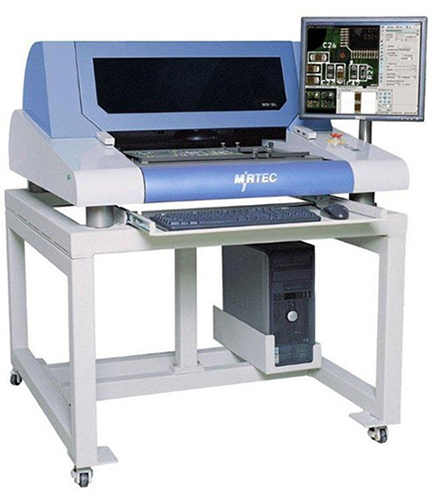 This is performed in a Japanese automatic optical tester from the company MIRTEC MV-2HT/2HTL. The AOI system is designed to automatically check for manufacturing defects both before and after the reflow of assembled boards. This system offers superior detection of defects. It detects the presence or absence of components, polarity of the component, precision of assembling position, lack of solder, short circuits and other faults. The software supports the continuous improvement of the process by allowing the user to track and eliminate defects on controlled assemblies. Every single assembled board passes through this. Control is performed according to a program created by our qualified workers. To fill our portfolio of our services we have purchased an automatic cable cutter and semi-automatic press for crimping connectors. We are thereby able to generate a huge amount of cable ties, from simple cables ended with FASTON connectors to complicated cable ties put into various housings.